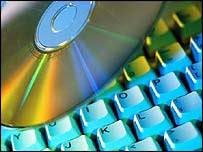 A Hong Kong man has been jailed for three months for film piracy after he shared movie files over the internet. The authorities say he is the first person in the world to be prosecuted for passing on files using a popular file-sharing program called BitTorrent. It makes the sharing of material easy by breaking a file up into fragments and then distributing them. The film industry says it hopes the sentence handed down to Chan Nai-ming will prove a deterrent to others. Chan, an unemployed man who called himself "Big Crook", was arrested in January for uploading three Hollywood movies - Daredevil, Red Planet and Miss Congeniality - onto the internet without a licence. He was using a popular file-sharing program called BitTorrent, which allows users to download content from multiple sources. Each source supplies a small part of the whole film or song. When anyone downloads a file it becomes a source for others, making it easy to share or trade music or movies, but very hard to trace who has uploaded or downloaded the material. BitTorrent also has many non-infringing uses as it offers a cost-effective way of distributing large files online. The Motion Pictures Association of America says its members lose $900m dollars in potential revenue to piracy each year in Asia alone. The authorities in Hong Kong hope that Chan's three-month sentence will deter others. But the BBC's Hong Kong correspondent Chris Hogg says that since April when Chan was first charged and his case was widely publicised, there has been no noticeable impact on the number of files being shared over the internet. The other problem is the time it takes to build a successful prosecution, making it almost impossible to carry out a comprehensive crackdown on small-time internet pirates, our correspondent adds. The movie industry started targeting the operators of BitTorrent networks themselves last December. It filed numerous lawsuits against BitTorrent server sites which linked to copyrighted material in order to undermine the ability to swap content. The action resulted in the closure of some high-profile BitTorrent sites. In May, US Federal authorities succeeded in closing a website that was distributing pirated copies of Star Wars: Episode III: Revenge of the Sith before the film opened in cinemas.